Often when you mention the probability of a lop along with a comparison to Turkey’s redenomination people will insist that there’s no comparison between Iraq and Turkey. On Tuesday we saw another excellent example of this when Breitling ranted yet again about the naysayers. “Turkey had no new prospects of the markets growing“, (7:30 in) he said. Let’s take a look at what happened with Turkey and see. Turkey’s currency depreciated in value from the 70’s until 2005 when they dropped 6 zeros from the exchange rate and issued the New Turkish Lira. Some have stated that at the time they did this they had runaway inflation. Not true. 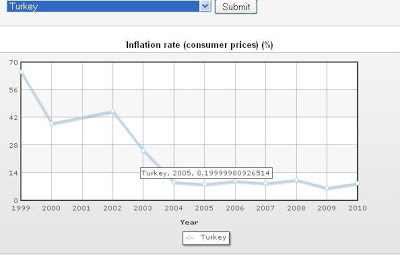 By the time they redenominated in 2005 the old lira had stabilized to the point that inflation was only around 8%, about where Iraq’s is now. Some people say that Turkey’s economy wasn’t growing at the time that they lopped. Also untrue. It was growing at a rate of 8.4% at the time. 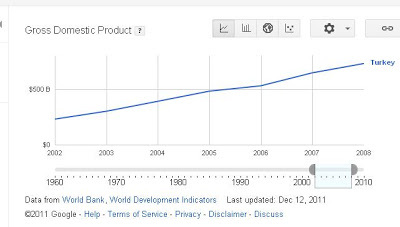 From 2002-2011 Turkey’s GDP more than tripled as it went from $231 billion to $772 billion. Growth projection for 2012 is 3.25% and for 2013 is 4.5%. No growth prospects, huh? You see it’s always easier to just throw unsupported claims out there on YouTube than it is to actually provide factual information with documentation like us “trailer park economists” do. Then there’s the belief that circumstances in Turkey were completely different from Iraq because of the disparity in oil production. While it’s true that Iraq has more oil than Turkey, apparently the economic conditions under which they redenominated were similar enough to cause Shabibi to say that there was a lot to learn from Turkey, in that they successfully removed zeros from their currency. Another misconception is that Iraq has a bigger economy than Turkey. Nope. Turkey’s is about six times the size of Iraq’s even though their population is less than three times the size of Iraq’s, which leaves them with a per capita income of 3.5 times that of Iraq. Why was Turkish Lira redenominated by dropping six zeros? As it is known, the high inflationary process, which started in Turkey in 1970s, has led to the expression of some economic values in terms of billions, trillions or even quadrillions. In this process, cash demand in the economy was met by new banknotes in larger denominations that were put into circulation nearly every 2 years since 1981. As a result, highest-denominated banknote (20.000.000) was used only in Turkey. And this fact had a negative effect on the credibility of our currency. Moreover, figures with multiple zeros led to problems in accounting and statistical records, data processing software and payment systems as well as in transactions at the cashier’s office. Therefore, redenomination of Turkish Lira became psychologically and technically essential. What are the benefits of removing zeros from Turkish Lira? – Transition to single-digit inflation restores the credibility of our currency. – The habit of using coins develops, thus allowing the transactions to be carried out in Kurus again. What is the name of our State’s new currency unit? Effective from 01.01.2005, the name of our New Currency unit is “New Turkish Lira” (YTL). The sub-unit of New Turkish Lira is “New Kurus” (YKr). One New Turkish Lira is equivalent to a hundred New Kurus. Why is the new currency called “New Turkish Lira”? While determining our new currency unit, the expression of “Lira” has been preserved, which is the unique currency unit traditionally used throughout the Republican period and identified in the international markets with Turkey. Besides, other countries that have dropped zeros from their currencies introduced the title “new” before the name of their national currencies in general. On the other hand, countries, which had to remove zeros many times due to hyperinflation, have preferred to introduce different names in order to avoid any confusion between old and new currency units. However; under the assumption that there will be no further need to drop zeros in the long run thanks to the sustained economic stability, the expression “New” has been deemed appropriate to precede the name of the national currency for a temporary period of time. 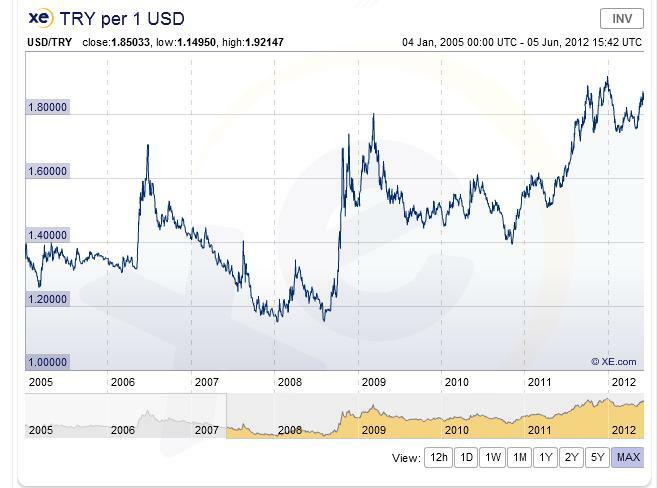 What is the conversion rate between Turkish Lira and New Turkish Lira? While converting Turkish Lira values into New Turkish Lira; one million Turkish Lira (1.000.000 TL) is equal to one New Turkish Lira (1 YTL). In other words, 6 zeros were dropped from our currency. That means 20.000.000 Turkish Lira and 20 New Turkish Lira have the same purchasing power. Why were 6 zeros rather than 3 zeros removed from our currency? Removing 3 zeros from our currency was inadequate to overcome the technical difficulties caused by multiple zeros. Dropping 6 zeros provides a parallelism to the denomination values in developed countries. What is the composition of denominations for YTL banknotes and coins? Coins: 1, 5, 10, 25, 50 New Kurus and 1 New Turkish Lira. The smallest coin denomination is 1 New Kurus. So, how are the transactions below 1 New Kurus concluded? Unit costs of goods and services can be specified below 1 New Kurus. As for transactions in New Turkish Lira, fractions equal to half-a-New Kurus or exceeding are rounded off to one New Kurus while less than half-a-New Kuruş is disregarded during payments and transactions. When were New Turkish Lira and New Coins put into circulation? New Turkish Lira and New Coins were put into circulation on January 1, 2005. Why was the operation performed in 2005? 49 countries had removed zeros from their currencies so far. Transition to new currency units in these countries had been performed along with a stabilization program in general, and following the successful results of the program on the inflation front. Since the successful implementation of the current stabilization program had produced favorable results, it was deemed appropriate to start the operation in early 2005. Moreover, the beginning of fiscal year wass preferred in transition to zero removal operation in general, in order not to impose burdens on real persons and legal entities liable to keep books and records with drawing up interim financial statements. How long will current banknotes and coins be in circulation? Current banknotes and coins will be in circulation until the end of 2005. Throughout 2005, Turkish Lira and New Turkish Lira banknotes and coins will concurrently be in circulation for one year. Starting from the January 1, 2006, Turkish Lira banknotes will be accepted during the 10-year redemption period and coins will be accepted during 1-year redemption period by the Central Bank of the Republic of Turkey (CBRT) and T.C. Ziraat Bank branches (where a Central Bank branch is not available). Why has been a one-year concurrent circulation period stipulated in transition to YTL? One-year concurrent circulation has been stipulated in order to enable our citizens to convert their banknotes and coins into new ones at their convenience throughout 2005. Hence, there is no need for individuals to rush for the conversion, since the currency conversion process will be accomplished in its natural course. What are the stages of the transition to new currency? Similar to the practices in most countries, the operation consists of two stages. At the first stage, TL and YTL banknotes and coins will be in circulation concurrently for one year as of 1 January 2005. At the second stage of the operation to be carried out on a later date after 2006, the expression of “Yeni” (New) before the “Turkish Lira” will be removed, and the use of the expression of “TL” will be reintroduced. May the redenomination lead to higher inflation? As it is known, rounding-off prices has become one of the most debated matters in Euro zone where a similar operation was experienced. Unlike fractional conversion rates used in transition to Euro, the operation in Turkey is merely a zero-removal operation. Therefore, rounding-off prices was expected to be smoother process in Turkey compared to Euro zone. Furthermore, according to official statements, the impact of rounding-off on general consumer price index in the first six months of 2002 has not exceeded 0.2 % in Euro zone. Besides, it should be kept in mind that the rounding-off impact already exists in Turkey due to high inflation and the lack of habit of using coins. As a result, the impact of rounding-off prices was expected to be temporary even if it realizes at low level. Afterall, it is clearly observed that the operation had no inflationary effect. The zero-removal operation was not expected to have either a favorable or an unfavorable effect on exchange rates or interest rates, apart from its positive impact on expectations, since the main factors determining the general level of exchange rates and interest rates are the economic fundamentals and the current stabilization program. Will the redenomination affect exchange rates or interest rates? How will the legislation, administrative, juridical and legal transactions involving Turkish Lira be concluded in terms of YTL after the transition to YTL? All references made to “Turkish Lira” or “Lira” in laws and other legislation, administrative procedures, court decisions, legal operations, commercial papers and other documents that produce legal effects as well as means of payment and instruments of exchange shall be considered to have been made to “New Turkish Lira”. Will the conversion of the documents issued in terms of TL into YTL during the transition process produce any fiscal liability? The parties shall be exempt from any and all kinds of tax, duty, fee and other liabilities arising from all kinds of legal acts, negotiable instruments and documents issued in terms of Turkish Lira producing legal effects provided that these are converted into the New Turkish Lira before 31 December 2005 (including that date) by taking the conversion rate into account. How will the price labels and lists displaying commodity and service prices be issued throughout 2005? January 1, 2005 and December 31, 2005. Those who fail to fulfill this obligation shall be subject to the penalty stipulated in the second paragraph of Article 25 of the same Law. What kinds of security features are incorporated into 100 New Turkish Lira banknote? 1- Raised Print (Intaglio): On the observe side, the portrait of Atatürk, the band on the bottom, blue-green guilloche design, “TÜRKİYE CUMHURİYET MERKEZ BANKASI” and “TÜRKİYE CUMHURİYET MERKEZ BANKASI BANKNOT MATBAASI” clauses, the value numerals and letters are printed in relief. 2- Optical Security Feature: The figure on the right-hand side of the portrait, printed by optically variable ink, changes its colour from goldish yellow to green when the note is tilted. 3- Windowed Security Thread: On the reverse side of the banknote, a metallic silver windowed security thread with a mini-lettering of “TCMB” takes place on the right. The security thread forms a straight line when the note is held against light and can be seen from both sides. 4- Latent Image: On the observe side, the blue and green coloured guilloche design at the lower right corner contains a latent image of the letters ”TC” that can be seen when the note is horizontally tilted against light at the eye level. 5- Watermark: On the observe side, the watermark of the smaller size of the portrait of Atatürk and the value numeral “100” are placed on the blank space at the left-hand side of the note and can be seen from both sides when the note is held against light. 6- See-Through Image: On the bottom left of the denominational numerals of 100 on the upper left corner of the banknote, the see-through register is placed, which forms the letters “TC”, combining with the elements of both sides when the note is held against light. 1-Micro Lettering: On the observe side, the denominational numerals of “100” are filled with the clause of “YÜZYTL” and the bottom of the lower band are filled with micro-lettering of the clause of “TCMB” and can be read with a magnifying glass. 2- Fine-Line Printing: The red and blue fibres embedded at the pure cotton paper are also visible under UV light. 3- Special Fluorescent Inks: When the note is exposed to UV light, 8 torch motifs and the signature of Atatürk appear on the ground of the portrait on the observe side..
4-Specially-Printed Serial and Sequence Numbers: On the reverse side, a nine-digit serial and sequence number, printed in red on the upper left corner, gives fluorescent red reflection and the serial number, printed in black at the lower right side, gives fluorescent yellowish green reflection under ultraviolet light. 5- Banknote Paper: Special banknote paper is used that does not glow under UV light. Is it possible to counterfeit all domestic and foreign banknotes? Yes, it is possible to counterfeit all banknotes. However, fake banknotes fail to involve security features of original banknotes. In the event of a control exercised over a few security features, it is possible to distinguish original banknotes from the fake ones. Are there additional security features incorporated into YTL banknotes for visually impaired? In order to facilitate the identification of the different denominations by all blind and visually impaired persons, the banknotes are printed in different sizes according to their denominations. Due to the repeated issue of new larger value denominations owing to high inflation, it could not be possible to issue different denominations in different sizes up to today. In the transition process to YTL, few differences were introduced to some banknote sizes (1, 50, 100 YTL). Following further improvement in Turkey’s current economic conditions and the zero-removal operation, the Central Bank is planning to introduce additional distinctive features to our banknotes issued with the latest technology on international standards, along with supplementary current measures, in order to help especially our visually impaired citizens. How should the banknotes be used for a longer life span? – Necessary care and attention should be paid not to mutilate banknotes. – Banknotes should not be wrinkled or perforated and nothing should be written on them. – Torn banknotes should not be taped for the sake of smooth operation of banknote handling systems. – The habit of using wallet should be widespread. – Soiled and worn-out banknotes should be exchanged at the Central Bank branches or via banking system. Where and how are the old and damaged banknotes exchanged? Whole banknotes, whose values can be identified, but are soiled, washed, dyed, burnt, torn or are worn or due to other reasons and the banknotes whose surface deficiency is less than 50% are exchanged with value at par. Banknotes with 50% surface deficiency are exchanged with new ones at half face value. The banknotes with more than 50% surface deficiency are not exchanged. Soiled, worn-out banknotes or banknotes incurring partial physical loss can be exchanged directly at the Central Bank branches or at T.C. Ziraat Bankası, our domestic correspondent, or at the branches of other banks and financial institutions. Is using soiled and worn-out banknotes dangerous to health? Research shows that some microorganisms reproduce at a higher rate on damaged and contaminated banknotes and skin infections such as abscess and gastroenteritis are diagnosed especially in cashiers. Along with the preventive health measures, one of the most effective ways to avoid possible negative effects of soiled and worn-out banknotes is to exchange them with the new ones and to use new and clean banknotes as much as possible. With the aim to extend the scope of its services in order to make TL banknotes in circulation available in the composition of clean banknotes as much as possible, the Central Bank is establishing banknote deposits with the T.C. Ziraat Bankası branches, exchanging worn-out banknotes on site, chiefly at touristic districts, and encouraging banks to return worn-out banknotes to the Central Bank. How did the transition to YTL affect bank accounts? Bank accounts were converted into YTL as of January 1, 2005. What is the currency code for New Turkish Lira? According to the information received from BSI (British Standards Institution) – ISO 4217 MA/Secretariat, the currency code for New Turkish Lira is “TRY 949 2”. When was the currency code for New Turkish Lira published in the official ISO currency code list? As of November 6, 2004, ISO Code of New Turkish Lira was published at “SWIFT Network”. Can “TRL” be used as the international currency code for Turkey besides “TRY”? In the broadcast message dated November 22, 2004, SWIFT announced that until the end of 2006, “TRL” code would be used along with “TRY” at the “SWIFT Network” and the cancellation date for the “TRL” code would be announced later, again via another message. In this context, as of December 9, 2006, TRL code was deleted from the “SWIFT Network” and “TRY” became the sole international currency code for Turkey.